Looking to whip up a special meal at home next week? Of course you can’t forget dessert. This recipe from 225‘s “Dining In” archives is a take on the traditional Tres Leches sponge cake, which is soaked in a decadent custard sauce. 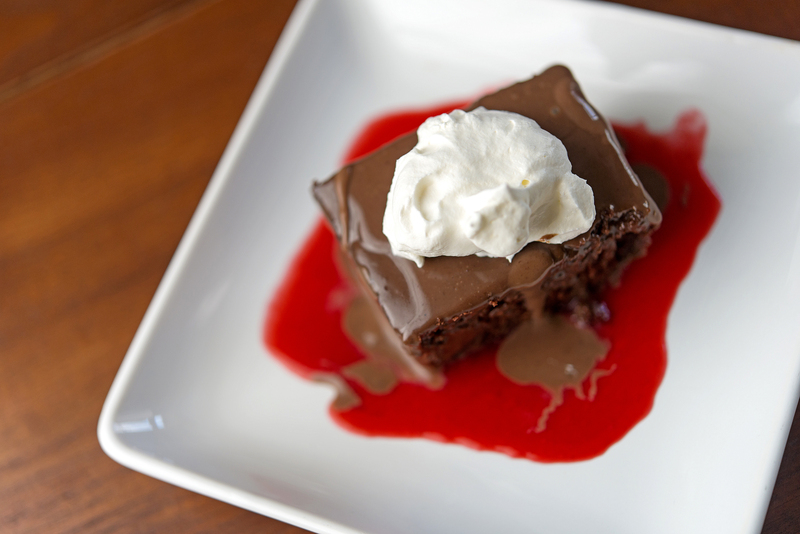 Here, it’s infused with plenty of chocolate and given some bright freshness with a tart raspberry coulis. As recipe writer Tracey Koch advises, the recipe can easily be doubled, but a small piece of this rich dessert goes a long way. 1. Heat the oven to 350 degrees and butter an 8-by-8-inch baking pan with one tablespoon of the butter. 2. In a mixing bowl, sift together the sugar, flour, baking soda, salt and cinnamon and set aside. 3. In a small saucepot, melt the remaining butter with the cocoa powder and water and stir until everything is smooth. 4. In a separate mixing bowl, whisk together the buttermilk, egg and vanilla. 5. Slowly combine the warm chocolate mixture into the beaten buttermilk and egg mixture. 6. Fold the wet ingredients into the dry until all is combined. 7. Pour the batter into the buttered pan and bake for 15-20 minutes, or until the tester comes out clean. 8. Remove the cake from the oven and poke holes all over the top. 9. Pour half of the Tres Leche topping (recipe follows) all over the top of the cake and allow it to be absorbed. 10. Pour the remaining topping over the cake and let it cool completely. Set the cake in the refrigerator for several hours before serving. Serve with the fresh raspberry coulis (recipe follows) and a dollop of whipped cream. 1. In a small saucepot, heat the chocolate and half and half together until the chocolate is melted and the mixture is smooth. 2. Remove from the heat and stir in the condensed milk and buttermilk. Reserve until it is time to pour it over the cake. 1. In a small saucepot, combine the raspberries, sugar and liqueur, and heat over medium heat until the sugar is dissolved and the berries have cooked down. 2. Allow the mixture to cool and then strain the sauce through a fine sieve to remove all the seeds. 3. Store the sauce in an airtight container in the refrigerator until ready to serve. This may be made a day in advance. The sauce keeps for up to a week. This recipe appeared in the February 2015 issue of 225.